The C&O Canal was constructed as America’s first nationally funded infrastructure project between 1828 and 1850. Its most visible piece of engineering are the lift locks. Given the irregular terrain of Georgetown, four locks were built to transfer vessels from one water level to another. For nearly 100 years, this canal operated as an industrial entity until it was damaged in the 1924 Flood and effectively replaced by railroads for transporting coal and other commodities. McMullan previously provided pre-design and schematic design services. Currently, and as structural engineer under an IDIQ contract led by the architect, McMullan is now providing design development, construction documents, and construction administration services for the rehabilitation of these two locks located between 30th and 31st Streets NW with Thomas Jefferson Street in between. Nearly failing, Lock No. 3 has required almost complete reconstruction to address water infiltration from the higher level which was undermining the lock walls and causing failure of the timber foundation. The 14-foot-high ashlar laid stone walls have been disassembled with the lock foundation, stone walls, wooden gates and associated hardware reconstructed using new and salvaged/reinstalled materials. Lock No. 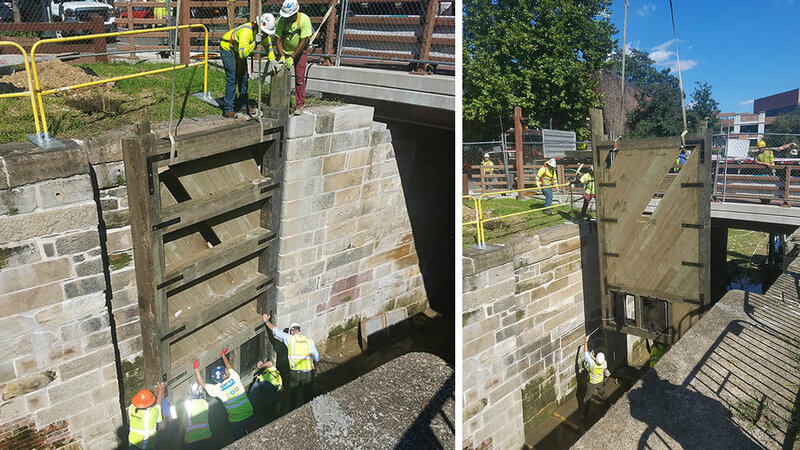 4 has required extensive repair work to maintain its water tightness and continual operation of the structure, comprising stone wall repair, replacement, and repointing as well as replacement of the wood lock gates and associated hardware. Together, both historic locks serve as highlights in National Park Service’s interpretive canal boat tour program and recreational use of the canal. Most importantly, these preservation efforts enable both historic locks to function as a flood control structure for the Georgetown Community and the flood prone Potomac River. McMullan Principal Douglas E. Bond, PE, SE is leading McMullan's efforts.